A middle-aged male presented to the ED with typical cardiac ischemic symptoms. The onset had been somewhere in the range of 3-24 hours ago (depending on who took the history). 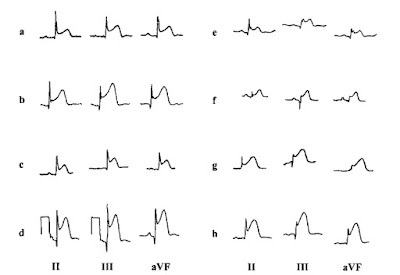 But also note the character of the ST segment morphology in III and aVF - it's the classic "tombstone" appearance! What's the medical term for "tombstone elevations?" Besides having an ominously picturesque name, does the morphology of the STEMI here contain prognostic information? Actually, this phenomenon has been well studied. "Tombstone" ST segment elevation is more accurately described as a STEMI with either "grade 3 ischemia" or "terminal QRS distortion (TQRSD)." It's defined in the inferior leads as a J point that is higher than half-way up the R wave. examples e-f do show TQRSD. It turns out that (on average) a STEMI with TQRSD has a significantly worse prognosis than those without TQRSD. More troponin release, bigger infarcts, poorer response to reperfusion therapy, and worse in-hospital mortality. After seeing the ECG, the ED team performed a focused echo, expecting to find significant systolic dysfunction. So how terrible was the ejection fraction? Actually.... not too bad. Pretty good, in fact. Sometimes our patients don't read the textbooks, and their hearts don't keep up with the electrocardiography literature! The post-PCI formal echo did not reveal any significant wall motion abnormalities. Aside from a bout of VF during stent placement, the patient did great! 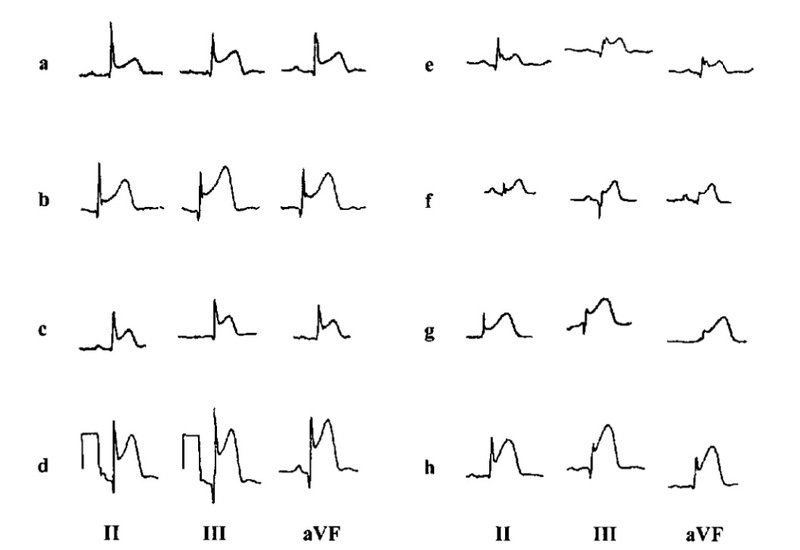 Prognostic significance of the admission electrocardiogram in acute myocardial infarction. Prognostic significance of the distortion of terminal portion of QRS complex on admission electrocardiogram in ST segment elevation myocardial infarction.